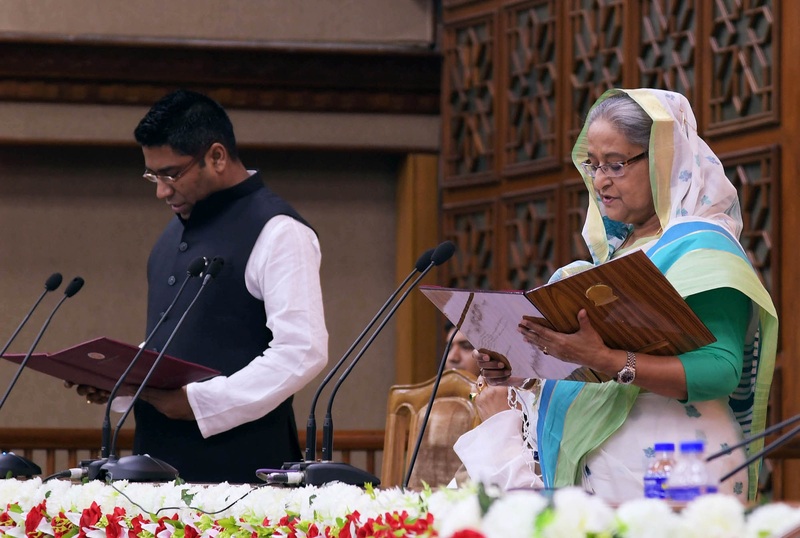 Photo: Newly elected mayor of Barishal City Corporation Serniabat Sadiq Abdullah take oath as Prime Minister Sheikh Hasina administer the oath at a ceremony at Shapla Hall on Monday. Dhaka, Oct 22 : Prime Minister Sheikh Hasina on Monday asked the public representatives to work for the welfare of people, not for making own fortune. “We’ve taken massive development programmes. You’ll have to be sincere so that every penny of the development allocation we provide is used for the welfare of people,” she said. Thanking those who cast votes for Awami League’s election symbol ‘Boat’ in the city election, Sheikh Hasina, also the AL President, urged the public representatives to convey her message to people that she seeks their votes for the Boat in the next general election.